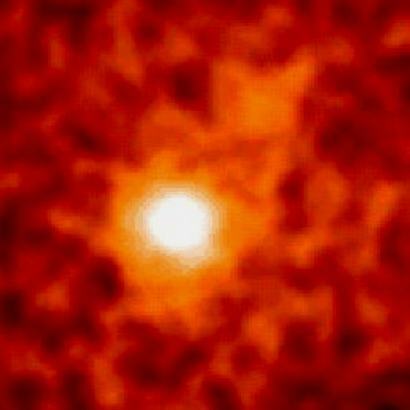 The bright object in the center of the false color image above is quasar 3C279 viewed in gamma-rays, photons with more than 40 million times the energy of visible light. Like all quasars, 3C279 is a nondescript, faint, star-like object in the visible sky. Yet, in June of 1991 a gamma-ray telescope onboard NASA's orbiting Compton Gamma Ray Observatory unexpectedly discovered that it was one of the brightest objects in the gamma-ray sky. Shortly after this image was recorded the quasar faded from view at gamma-ray energies. Astronomers are still trying to understand what causes these enigmatic objects to flare so violently. Another quasar, 3C273, is faintly visible above and to the right of center.